I have a friend who stuck some old cassette tapes onto a square vase and filled it with flowers. It looked really effective. Simply stick on with Blu-tack or self-adhesive strips which, unlike glue, won't leave a mess or damage your vase or tapes. By the way, you can actually still buy blank cassette tapes from Amazon, believe it or not, so if you don't have any to hand then you still have this option open to you. You could even create your own hanging cassette decorations. This low-cost cassette tape bunting features authentic cassette designs that look just like the brands I used to buy back in the 80s such as Memorex and Maxell. If you hang above a shelf, then you can add other items underneath such as the retro toys as shown in the picture above. 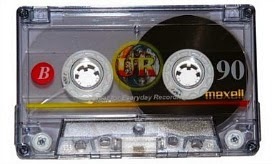 Alternatively, why not create your own bunting using real cassettes? 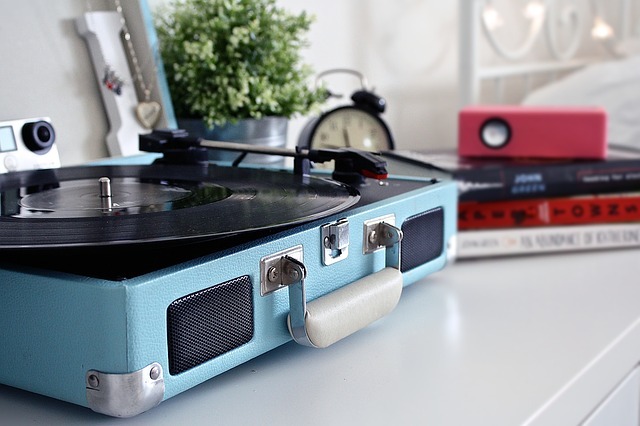 Another option is to dig out your old vinyl. Suitcase record players are very much in fashion at the moment and one of these would look great at any party, and you guests could will have fun choosing which records to play. Maybe you could ask them to bring their own favourite single or LP along with them. Alternatively, you can mount records on your walls to use as a decoration or thread colourful ribbon through the centre and create hanging decorations. Now, don't ask me whether this was a bought rack or a self-made one, because there are no further details given. However, it's a quirky idea, although you will need to make sure it's sturdy enough to hold your wine, of course! This is a simple idea I found on Pinterest. Now, here's a simple but effective idea. Simply add a few old magazines from the 80s to your room and your guest will have great fun reading and discussing them. They're a wonderful way to get conversations started and rekindle old memories. If you didn't keep any magazines, then you can always try ebay. Search for favourites such as Look-In, Smash Hits, Number One, TV Times and Radio Times. You could even cut out posters/pictures and create a collage for the wall. Add a bowl of retro sweets/candy/chocolate to each table so that everyone can dip in. Alternatively, place the sweets in paper bags just like you used to get from the sweet shop, or use party favour bags. There are lots of ideas for British sweets from the 80s at my website. Cupcakes are a retro favourite, and these toppers featuring 70s and 80s sweets and chocolate made from edible wafer card and ink are a great idea. Many of us will still have old toys or games that we kept from our childhood. Dig them out, give then a clean, and add them to your room. Your guests will have fun playing with them. You could encourage your guests to play old board games such as Snakes and Ladders, Ludo or Tiddly Winks while waiting for the other guests to arrive, or before the party really gets started. It would be advisable not use use more complex games such as Monopoly or Chess as your guests may be playing for the entire evening! As I mentioned near the top of the post, the ideal toys would be a Rubik's Cube/Snake or an Etch-A-Sketch which are instant fun. If you have a View-Master with some film reels then they would really go down a storm at any 80s party. There were a great many of us who played Twister back in the day, and it's ideal for kids and adults alike. This is the perfect party game and is currently a best-seller at Amazon (as I write), proving that you can't beat the classics! Other popular games were Simon, Connect Four, Guess Who? and Battleship. I also discovered lots of suppliers selling decorations on ebay. Nothing shouts out "It's party time!" more than balloons. They have been around since Adam was a lad, and add an instant retro party feel to any room. 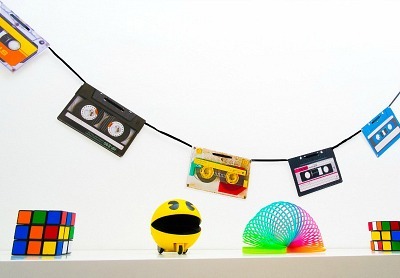 These 80s party balloons have recently appeared at Amazon and are a must-have if you're serious about creating a retro party atmosphere. 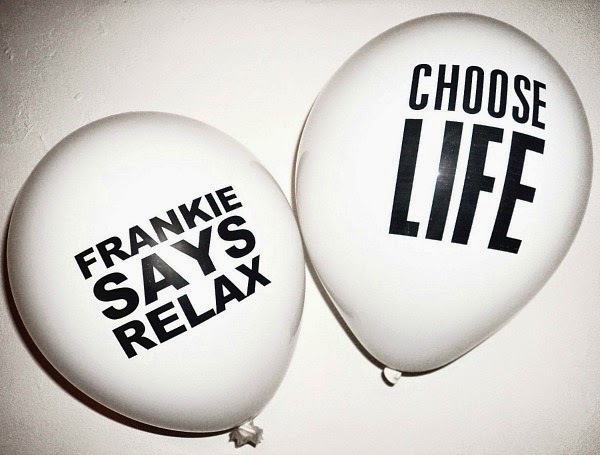 The "Frankie Says Relax" and "Choose Life" slogans are an iconic reminder of the great decade, and now they're available printed on to balloons, too! 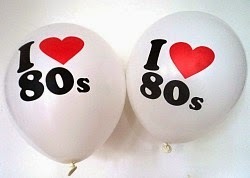 These particular balloons are only available in the UK and supplied by 80s Material Girl. I was very pleased to see these drink coasters which match the table runner. Also available at Amazon.com. There are actually plenty of designs to choose from at Amazon, with some designs featuring computer games such as Donkey Kong and Pac-Man. 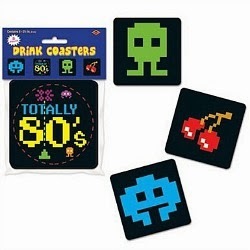 Some coasters can be bought individually, rather than in packs, allowing you to mix different styles and add some variety to your table. 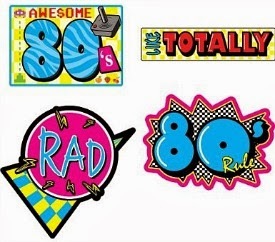 These American-style decorations will add some extra 80's colour to your room. There are four in a pack and you can place them almost anywhere you wish. They're not self-adhesive, so you can move them around and use them again and again! Now you've sorted out your room decorations, all you need to do is invite some friends. 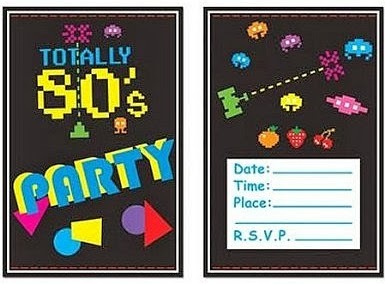 This pack of fun invitations will show that you're totally serious about your retro party! I'll leave you with some more ideas - have fun! 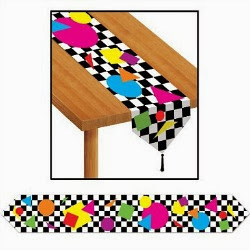 This stand-up ghettoblaster decoration would an awesome addition to any 80s party room. 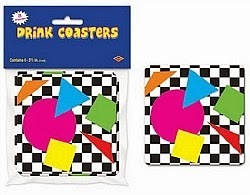 This item is only available in the United States, but there alternatives Boombox decorations at Amazon UK.